by Hannah Vickers, recent MPhil Textile Conservation graduate. 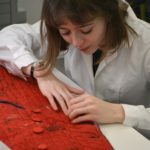 Earlier this year I completed the treatment of a unique bloodstained jacket from Annan Museum, part of Dumfries and Galloway Museums Service (for more information about the garment’s history see: A Study in Scarlet . The front of the Mackenzie jacket, before conservation © University of Glasgow and Annan Museum, 2016. 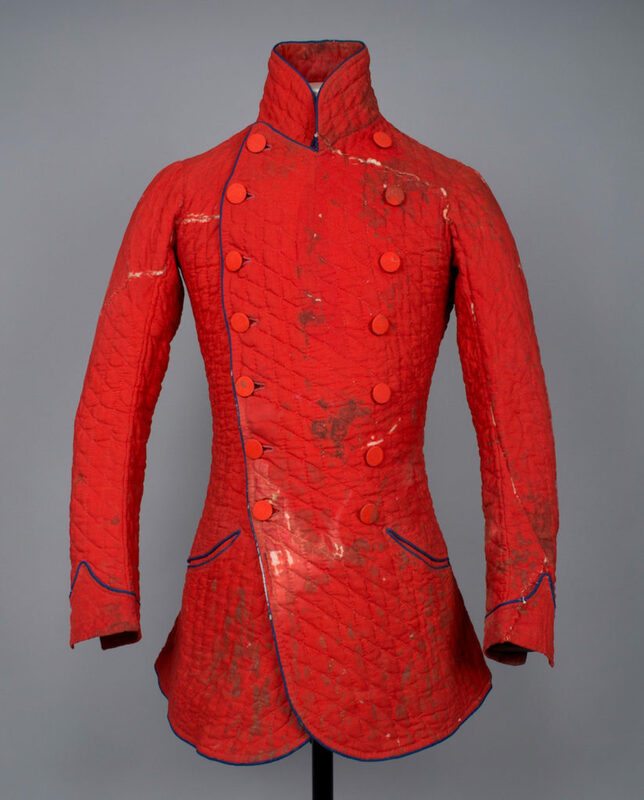 The jacket once belonged to Lieutenant-General Colin Mackenzie, commander of the Ellichpúr division of the Hyderabad contingent, who, in 1855 was attacked by mutinying soldiers. He lived to tell the tale, keeping the jacket as evidence of his narrow escape. 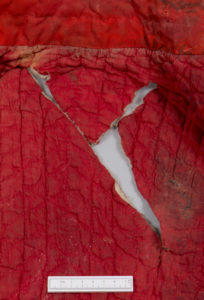 The jacket is to be exhibited early in 2017, however, it was not initially safe for display; the sabre slashes were at risk of opening further in their unsupported state, and it was suffering from signs of previous moth and mould activity. Therefore, I was given the exciting (and admittedly, slightly daunting) task of its conservation. 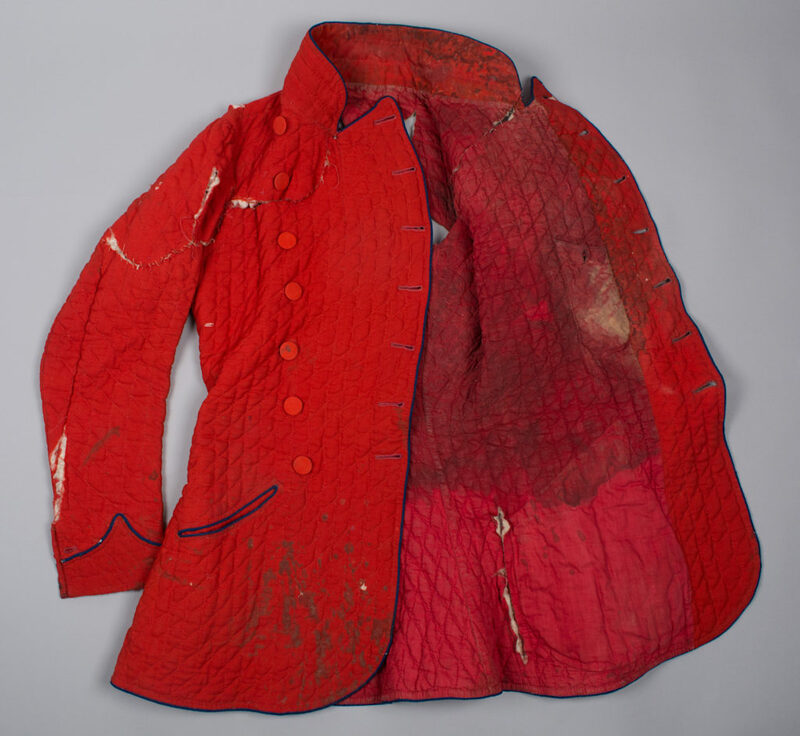 Much of the treatment was devoted to documenting the appearance and construction of the jacket and the history of Colin Mackenzie, to assess the significance of the blood stains, slashes, signs of wear and previous repairs. Together with documented accounts of the attack, newspapers and government reports, the jacket paints a vivid and tangible picture of the events of 1855, which has been described as a precursor to India’s First War of Independence in 1857. The importance of the stains and damage made it clear that one of the priorities of treatment should be to leave these unchanged and visible for display. After surface cleaning to remove the signs of moth and mould, I tackled the problem of supporting the slashes. Some were gaping open with cotton wadding emerging from the quilted fabric, whilst others had been roughly sewn up in thick thread. I was initially keen to remove these previous repairs, as they obscured and distorted the most dramatic of the slashes on the sleeves, which ran from shoulder to wrist. However, analysis of the threads and discussion with curators at Dumfries and Galloway Museums Service showed that they had probably not been undertaken in the past 40 years, and may have been carried out by the Mackenzie family. 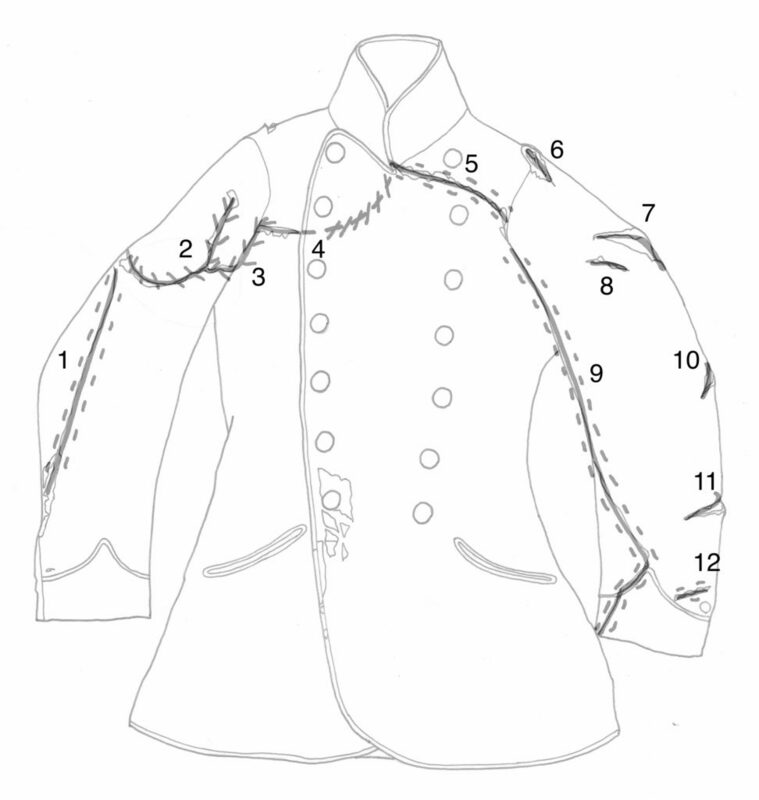 I decided to leave the repairs in place, as they formed a part of the jacket’s ongoing history. You can never exclude the possibility of more information coming to light in the future. 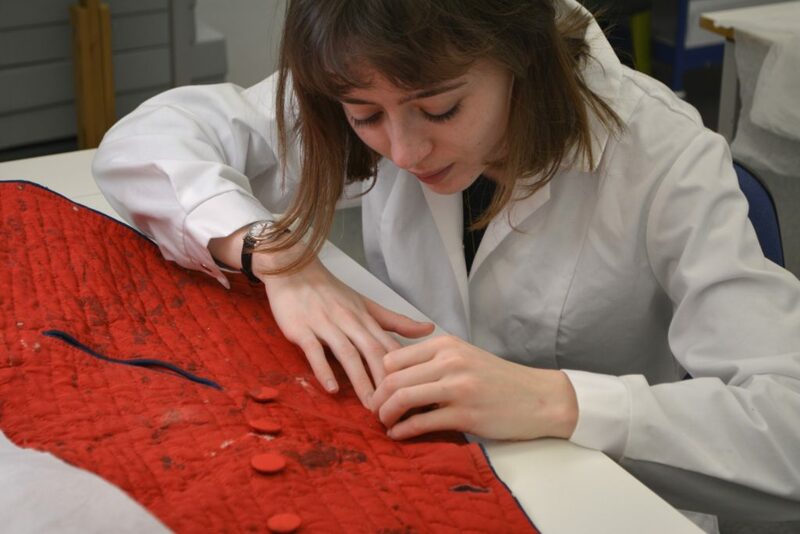 Stitching an area of damage on the front of the jacket © University of Glasgow and Annan Museum, 2016. To support the slashes without obscuring them, I decided that a stitched treatment using strong but transparent material would tick both boxes. Fine, monofilament nylon net seemed ideal, but would it be strong and stable enough? I tested the method out on a weighted and slashed replica piece of quilting; finding the method to be sufficiently supportive, I decided to go ahead with the treatment. Dyeing the net to match the fabric of the jacket ensured that the support was as unobtrusive as possible, yet still easy to spot under close examination. 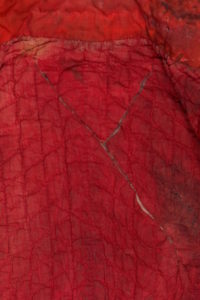 Using net on both the outside and lining of the jacket meant that the slashes and stains were visible from the inside too. A sabre slash before stitched support © University of Glasgow and Annan Museum, 2016. A sabre slash after stitched support © University of Glasgow and Annan Museum, 2016.. The jacket after treatment, mounted for display © University of Glasgow and Annan Museum, 2016. The talk will take place on 6th February 2017, 6:30 – 8pm at Dumfries Museum. Karen Finch, “Textiles as documents of history and those who care for them.” in Textiles Revealed: Object lessons in historic textile and costume research, edited by Mary M. Brooks and Joanna Marschner, 7-16 (London: Archetype Books, 2000), 9. What a great result Hannah at the end of your lengthy treatments, and so good to see the finished work on the mannequin. I’m sure your talk on 6th Feb will be very well received, and I’m delighted you have the opportunity to explain firsthand to a local audience.